While the "Renaissance Lac Brome" meeting attracted 300 people in Knowlton on October 14th, to discuss the state of the lake, one Lac Brome resident was in Montana at a research and development site learning about cutting edge technologies for dealing with the very water-quality issues that are affecting the Lac Brome region. Mario Paris, president of"CanadianPond.ca Products Limited", located in Lac Brome, received an invitation from Bruce Kania, renowned inventor, researcher and environmentalist, to visit his Montana research facility to learn more about his newly patented "floating island" system for aquatic restoration. Bruce Kania is making waves around the world with his artificial floating islands that become living filters for lakes and remove elements like ammonia, phosphorous and other unwanted materials that can lead to algae blooms and other unhealthy lake conditions. The Montana seminar brought 12 of some of the most enthusiastic business people in the aquatics field from all over North America to attend a hands-on information workshop on restoring lakes through the use of the innovative new system. Mr. Paris's firm was the only Canadian business invited to the meeting. During the session the invitees took part in educational sessions that presented the latest data on the cleaning effects of floating islands as well as launching of several large floating islands at the research facility. The floating islands are being employed in pilot projects in cities like Chicago to deal with water quality issues and there are also several ongoing studies by American Universities and independent firms in the US and New Zealand to fully qualify the potential of the islands to help with problems such as blue-green algae and cyanobacteria. 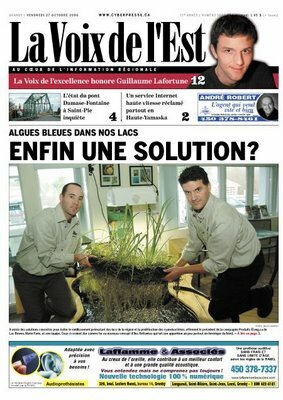 Friday saw the news of the Lac Brome company making front page headlines on the Voix de L'est newspaper and on Saturday Radio-Canada aired a news report on their National television network about the floating islands and the small Knowlton company, the only authorized dealer of the islands in Canada. 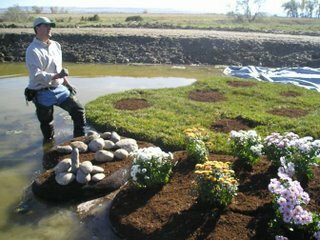 Floating islands are a newly patented technology that uses recycled materials to create a special buoyant "matrix" that plants can grow in. The island material becomes a habitat for beneficial, water-cleansing bacteria. The roots of the plants also combine to add a natural filtration to the water. The islands also provide habitat for birds and shelter for fish making them a truly ecological solution. According to recent findings, a single 250 square foot island can offer as much restorative benefits as an acre of constructed wetlands. These floating island "breakthroughs" are allowing municipalities around North America to address water quality problems at a fraction of the cost associated with building traditional wetlands. 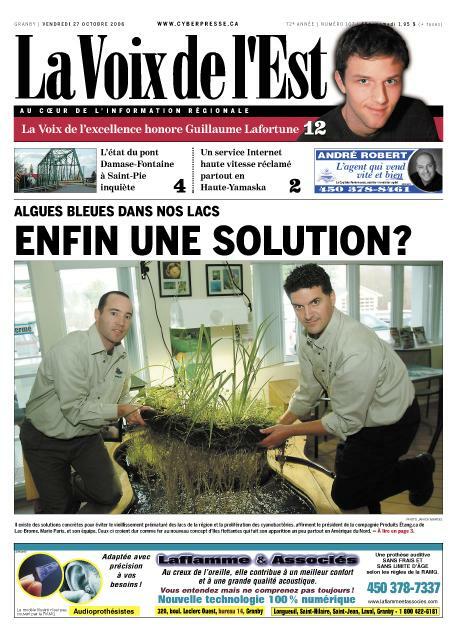 Who knows, perhaps one day Lac Brome or Lac Waterloo will have some floating islands to help clean up the lake water!